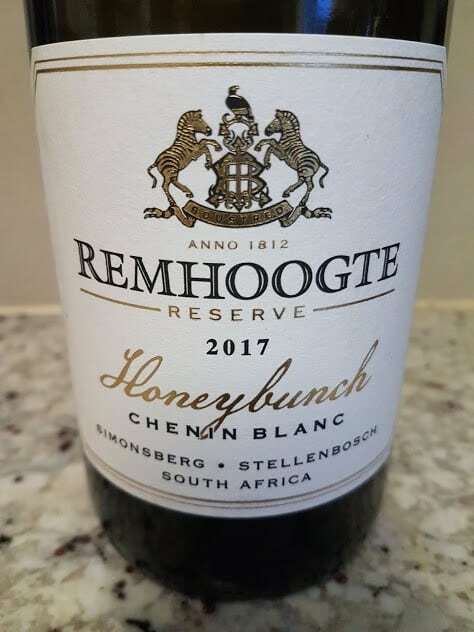 Honeybunch Chenin Blanc from Remhoogte in Stellenbosch is a particular take on the variety. The rows of the 31-year-old vineyard which supply the grapes run from north east to south west, one side getting milder morning sun and the other harsher afternoon sun and it’s only the bunches on the morning-sun-side that are used for this wine giving it a noticeable honeyed character. The current-release 2017 underwent spontaneous fermentation which took eight months to complete, maturation lasting a total of 12 months in French oak, 20% new. The nose is exotic with a honeysuckle top note before orange, peach and pineapple. 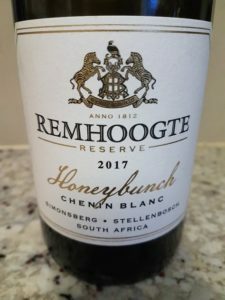 The palate is super-rich and sweet although there’s also tangy acidity in evidence plus a little phenolic grip on the finish. Dramatic stuff and definitely not to be drunk as an aperitif – alcohol is 13.72% and RS is 5.0 g/l. Approximate retail price: R235 a bottle.